I wasn’t sure how Catie would deal with the loss of Teenie. She’s known that cat her entire life. We talked for several days beforehand about how Teenie was very old and sick, and how it was almost time for her to go to Kitty Heaven. But I was dreading telling her about it when it happened. The poor kid has been through quite enough over the past year, she deserves a break. She took it all really well at first. She knew it was coming, so it wasn’t a total shock. But the next day, she walked into the room and said, “Mommy, I just don’t feel like myself without Teenie here.” I told her that I knew exactly what she meant. Then she burst into tears. There wasn’t anything I could do except hold her while she cried for a long time. She asked if since Teenie had died, could she get a puppy? I said no way, kiddo, sorry. Mommy is responsible for cleaning up quite enough poop around these parts. We aren’t adding a puppy to the mix. She said, then can I get a hamster? I said no, because hamsters stink and Mommy doesn’t want to clean its cage. She said, then can I have a fish? I’m not made of stone, y’all. Their names are Mario, Luigi, and Yoshi. Catie named them herself. Obviously. So, yeah. Fish. At least they’re really low-maintenance pets, right? This entry was posted in Cate, Pets and tagged Catie, cats, fish, Pets, Teenie by Cindy. Bookmark the permalink. Oh, God. I don’t mean to be the anti-Greis/Debbie Downer/unsupportive blog commenter, but… fish are not known for their hardiness or their long lives. I am a crazy animal lady to the nth degree, as you know, and I’ve had it all from fish to hamsters to rabbits and parakeets and guinea pigs and frogs I raised from tadpoles to dozens of ducklings I hatched myself in an incubator… and comparatively, I had a lot of fish-related heartbreak. Then again, Gwen had a carnival goldfish that lived for more than a decade. Poor Catie. Teenie was one of my favorite Internet pets. I wish for long and hardy lives for your fish. I know nothing about fish but am glad you found a way to say yes to your girlie. Who knows how long the fish will live or how interested she will stay in them, but she’ll remember that she told you she was unhappy and you did what you could to fix it. Oh I am so sorry for the loss of your cat! Certainly no one can fault you for the fish – I’d have done the same. 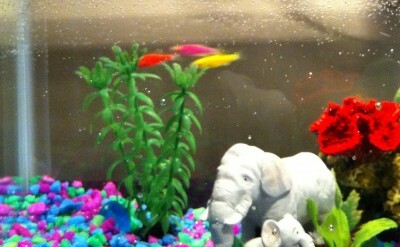 And those are some brightly colored fish! Enjoy them!